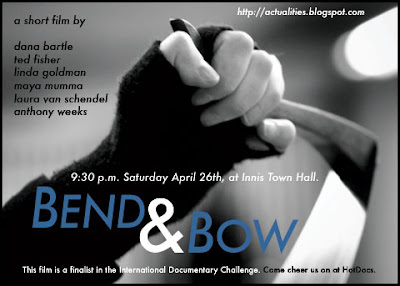 Our film "Bend & Bow" will have its world premiere at HotDocs Canadian International Film Festival on Saturday, April 26th at 9:30 p.m. It will screen with 13 other International Documentary Challenge finalists, and the winning films will be announced. It looks like all six members of Profluence will be attending, so come say hello. Get your tickets early, though -- last year's event was sold out.